The sofa and Roman shades (fabric by Osborne & Little) strike a vibrant tone against an indigo wool and jute rug from Moattar in Atlanta, a steel blue Milo Baughman chair, and a deep blue and black Bergere. The trio of lighting pendants is 1960s vintage. Mid-century art by P.R. McIntosh and others light the stairway with fluorescent color. The 1960s chrome disc chandelier is by Verner Panton. The chrome four-poster bed is custom, the U-shaped marbleized night table is by Baker, and the rug is by Madeline Weinrib. 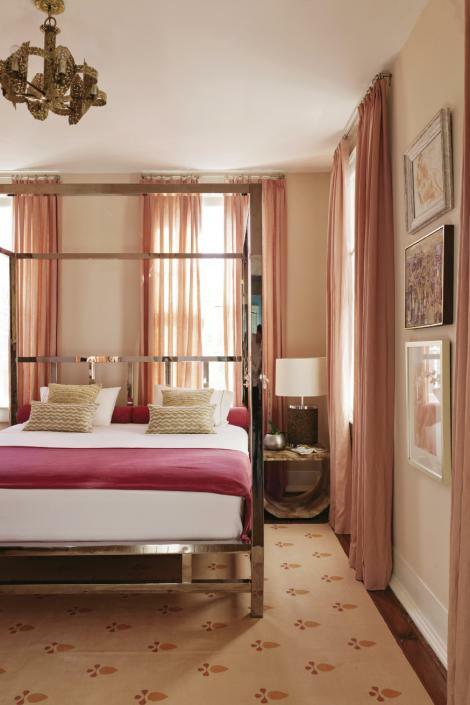 Sheer raspberry draperies echo the pale pink walls. Angie (pictured with Rose the cat) re-covered this Milo Baughman sectional in a fuschia woven fabric by Glant. Sasha’s bed is outfitted with a graphic tapestry from Urban Outfitters; Angie had the bolster pillow made from the same fabric. 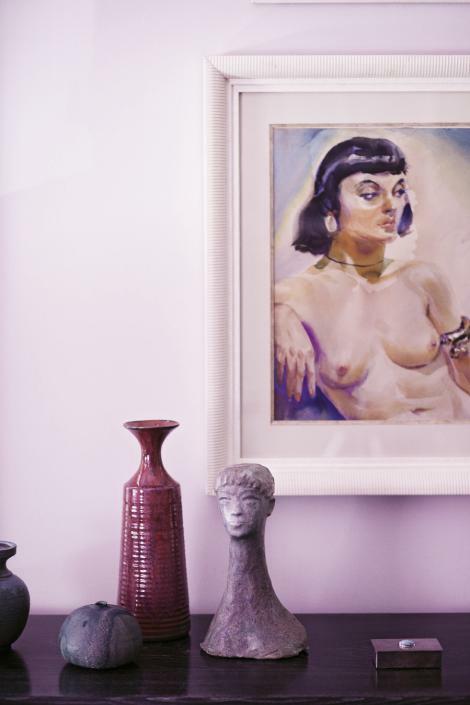 A 1950s South American painting and assorted pottery. 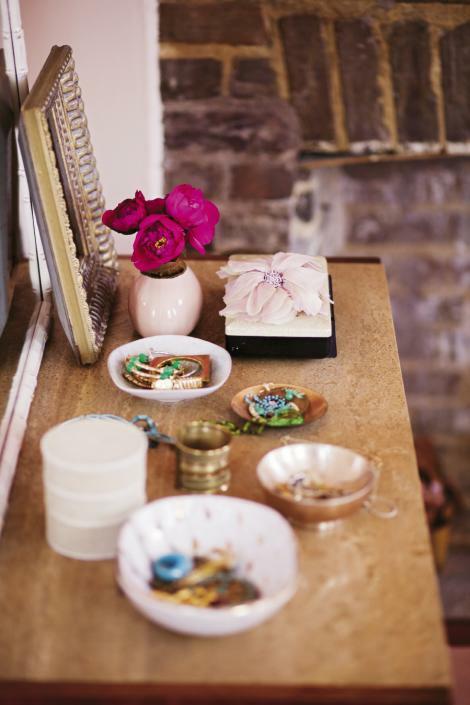 A vintage Baker dresser holds a collection of curiosities in the master bedroom. 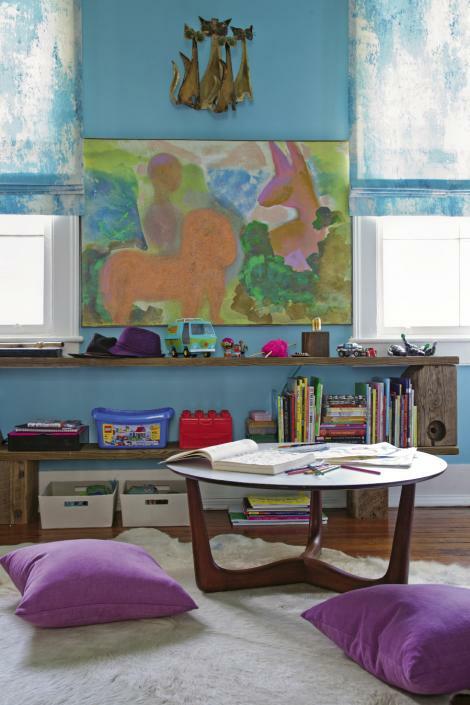 In Loulou and Sasha’s room, a Danish Rosewood coffee table with laminate top, a cowhide rug, and low shelving create a comfy kids’ work area. 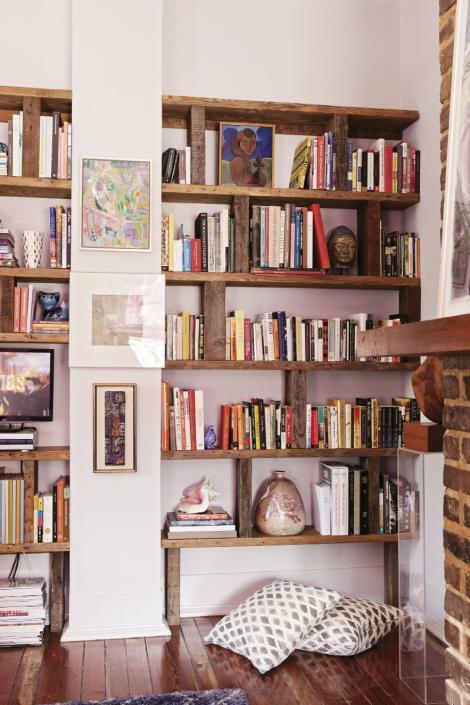 In the living room, modular bookcases were built by local artisan Capers Cauthen. Angie, Loulou (11), and Sasha (seven) in the dining room, which is separated from the galley kitchen by a small partition. The white Tulip table is an eBay find, the chairs are 1960s Danish, and the clear globe pendant is by Kartell. Angie Hranowsky isn’t really a beige kind of gal. Hot pink, sure, and plum works, too, but a house full of safe and surefire neutrals without a healthy dose of daring, a punch of the unexpected? That’s never been her thing. The trailblazing interior designer, known for her pre-Mad Men penchant for mid-mod style and brave (if unlikely) fabric and color pairings, was hailed as one of Southern Living’s “New Tastemakers” just last year, and her work has splashed shelter pubs ranging from Lonny to Metropolitan Home several times over. And yet, the “uniformly pale, beige” rooms in her new apartment—a two-bedroom single on Bull Street—were a big-time score. Because rather than seeing bland, Angie saw a blank slate—one part cozy domicile for her and her two young children (Loulou, 11, and Sasha, seven), one part fiercely creative design lab. “This was that rare project that I get to do for myself, so every color—every idea—was on the table. I was ready to mix paints, try new palettes, and be free to make mistakes,” she says. Her biggest concern in this leap from somewhat suburban neighborhoods (first in Avondale, then Riverland Terrace) to downtown dwelling was installing a sense of permanence. “Apartments can feel chopped up and disconnected or worse, impersonal. This needed to feel like our house,” says Angie. There were a half-dozen quirks here and there (i.e., walls had awkward alcoves thanks to fireplaces and odd piping, the galley kitchen was sectioned off by a partial divider), but it was a fairly straightforward challenge: two rooms apiece on the first floor and second, plus a center hall and two tiny bathrooms. For Angie, solutions were everywhere—floor to ceiling, upstairs and down. Here’s how she switched this standard-issue single into a haven of high design and family-friendly comfort. 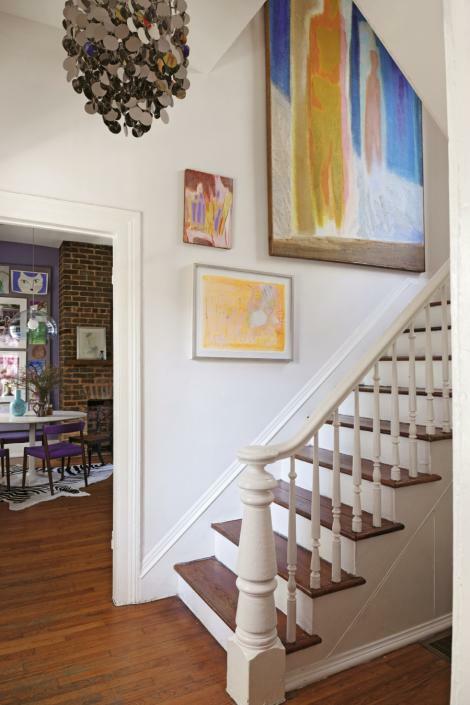 For Angie, these were paint and light fixtures—switching up these elements in each room (hallways, too) gave the house a starting point that was more her style. Though swapping out basic light fixtures in a rental is always a fast face-lift, Angie chose chandeliers and pendants that were more than just upgrades. She ushered in statement pieces like a 1960s Verner Panton chrome disco chandelier in the hall and a trio of vintage globe pendants in the living room. “The vintage chandeliers add originality and interest juxtaposed against the classic architecture,” says the designer. So a Milo Baughman sectional was re-covered in the vibrant Glant fabric and played up—rather than down—with semi-translucent pink patterned Roman shades. In every room, in fact, window treatments dial up the drama by echoing the colors of either the wall paint or primary pieces of furniture. 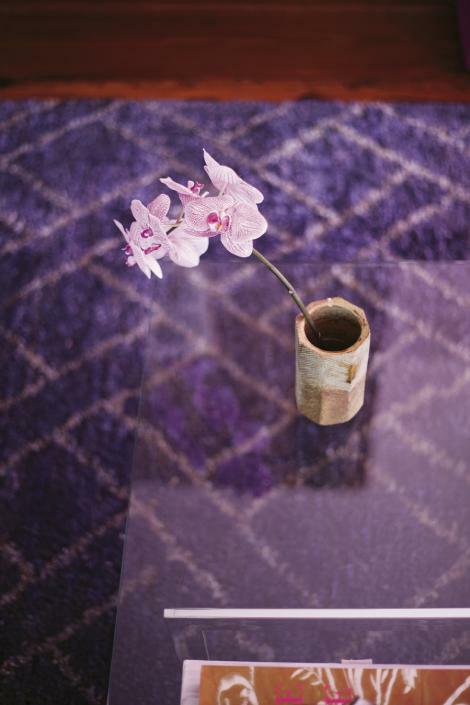 And in the dining room, a set of four simple Danish dining chairs was re-covered in a bold purple metallic weave a few shades darker than the walls. “When I was working on the living room, I had to remember that we don’t have another hangout room, like a den or a sitting room. This is it. It has to be comfortable, it has to be inviting enough for everyday,” Angie says. She replaced the structured, low-slung sofa from her old house with a cozy sectional and offset a round Baughman chair with a soft, century-old Bergere for stretching out. In the upstairs bedroom the children share, Angie envisioned streamlined L-shaped beds, leaving plenty of wall space for art and other design ideas. “But Loulou was dead set on the idea of a tall loft bed; we went around and around until finally, it came to me. I thought, ‘Well, it’s her room, why not?’” So up went the six-foot loft towering over Sasha’s bed, and meanwhile, the designer worked with a friend to fashion low bookshelves to fit under the windows. She hung a large-scale painting by P.R. McIntosh from the late ’60s over that, along with a sculptural arrangement of copper cats.